Anne Frank House is the origanl house and museum dedicated to Jewish diarist Anne Frank, during the World War II. The building is located in the Prinsengracht of Amsterdam. 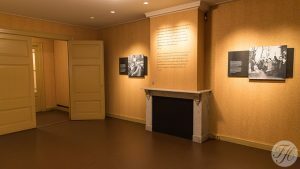 During World War II, Anne Frank hid from Nazi’s with her family in the hidden closet room at the rear of the canal house, known as the “Achterhuis”. Anne Frank did not survive the war. The emotional story and her diary was published in 1947. Anne Frank Foundation was established to protect the property from developers who wanted to demolish the block. The museum opened on 3 May 1960. It preserves the hiding place of Anna Frank. It also has a permanent exhibition on the life and times of Anne Frank. And a very special exhibition space about all forms of persecution and discrimination. In 2013 and 2014, the museum had 1.2 million visitors and was the 3rd most visited museum in the Netherlands, after the Rijksmuseum and Van Gogh Museum.